How best to get exercise while enjoying the world of aviation? Well, you could pedal like mischief at the controls of a human-powered plane, but here's a better idea: Try hiking the Kealia Trail above Dillingham Airfield on Oahu. 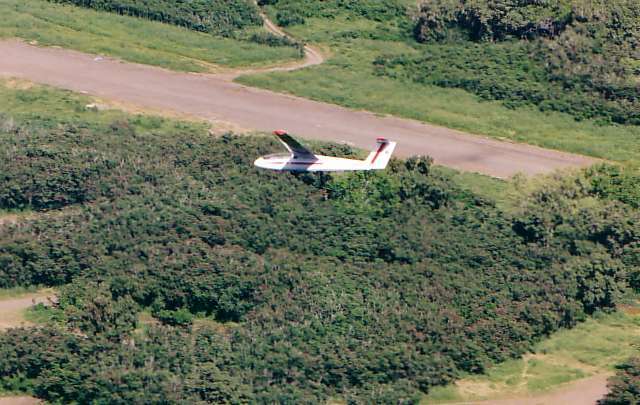 The trail ascends a cliffside south of Dillingham's runway in a series of switchbacks and lets you watch the airport activity from pattern altitude at about the distance of a downwind leg. The hike up takes about 40 minutes for someone who is fit, over an hour for the leisure crowd. 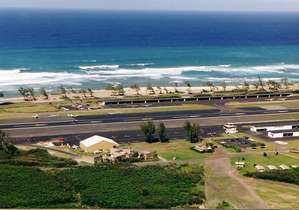 The view of the airfield is a remarkable perspective in itself, but since Dillingham is used extensively for glider flying and the best lift can be found right up against the hillside, you get to enjoy the local gliders way up close and personal. Begin the adventure by flying or driving to Dillingham, then park your transportation near the control tower. For autos coming from Honolulu, you need to drive past the entrance for the glider rides, then take the next left turn, which passes west of the runway and brings you to the south side of the field. A large paved parking lot awaits. From the lot, walk twenty yards towards the hills until you see the trailhead in the photo to the right. 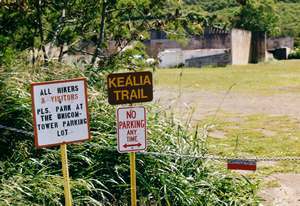 Stay to the left of the large concrete building you see in the photo and you will be hiking on a dirt automobile path. In a few minutes the trail becomes a single track and begins angling up the hillside. 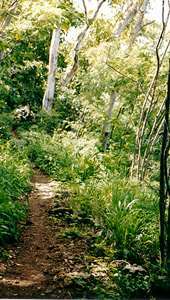 Much of the hiking takes place in the shade of overhanging trees. 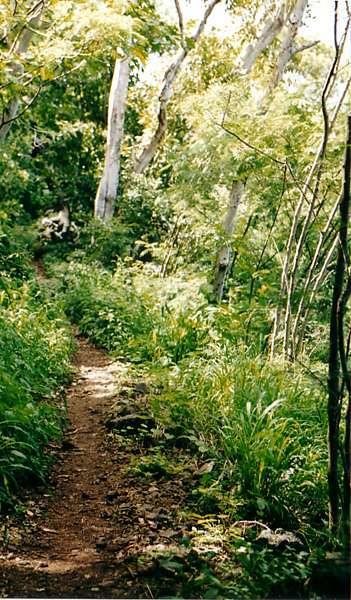 It can get warm during a low-altitude Hawaii hike, so bring something cool to drink. Winter provides more shade on the trail, particularly in afternoon. The biggest requirement for a successful hike is trade winds. The trades create the ridge lift which brings the gliders in close to the ridge, so wait for winds from the northeast before setting out on this adventure. On my hike up the trail in March I stirred up a huge partridge which soared down the slope. Higher on the hillside the wildlife tended to be more of an aeronautical flavor with a covey of Schweizers, a pack of L-19 Bird Dogs, and a few loner Grobs sharing the nearby territory. As you climb the hillside, you'll have excellent views of the airport as well as the nearby beaches and surf. At the very top of the hike you come to a picnic table with a shade cover over it. Here's a good place to catch your breath and take a drink (of that liquid you so thoughfully chose to bring with you). Don't spend too much time here, though, because it is difficult to enjoy the sailplane activity from this location. Instead, descend about 3-5 minutes down the trail until you reach a spot from which you can follow air traffic coming from either direction. Gliders pass by so close you could wave to them and you might even receive a wave back. Since your altitude is absolutely fixed while standing on the hillside, you have a perfect opportunity to see how well each glider is doing with the lift. Some will come close to the hillside, climb above you, then lose altitude closer to sea before returning for more lift. You'll be looking up at one, down at another, and eye-to-eye with a third. Sometimes the pilots flying the L-19 tow planes will bring a glider right beside the cliffside so as to use the lift to gain altitude quicker. 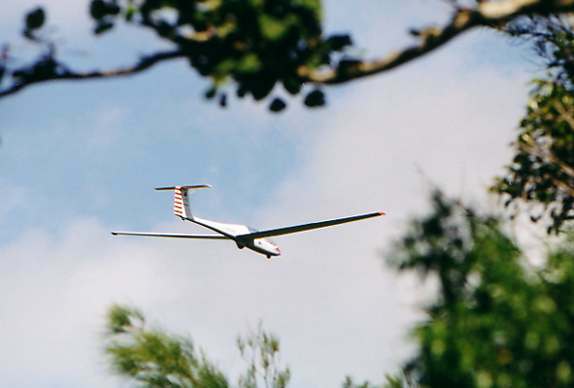 This is one of the few opportunities to hear the flying machine coming, because the gliders themselves are nearly silent, even at close quarters. 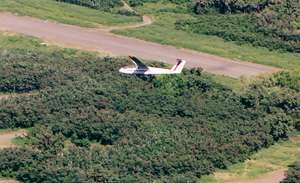 Dillingham Airfield has long been a great location for a picnic lunch and enjoying various types of sport flying. 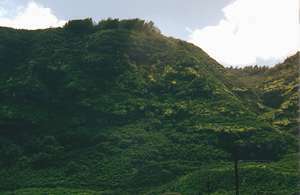 Add in one of aviation's best airport hikes, and you have yet another reason to head for Oahu's north shore.